Considering a built-in or a unique piece of furniture for your home? I can incorporate antique or other special elements, and typically develop detailed renderings to help you understand how the finished product will fit into your existing decor. I can work with you directly, or am happy to coordinate with your general contractor as part of a larger project, and I’m able to fabricate either in-shop to spec, or - especially for older homes where angles are not square nor floors level - on-site to make sure the fit and finish is perfect for your space. And I’m not happy unless you’re happy! Both large and small, freestanding furniture and built-ins, lamps and tables. I look forward to hearing about your special requirements! 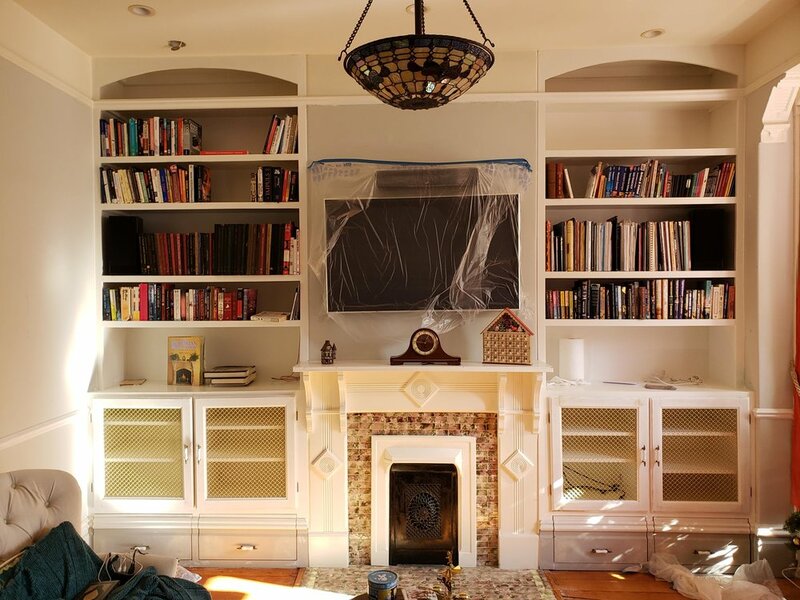 This pair of built-ins on either side of the existing fireplace almost quadrupled the storage space of the free standing units it replaced, and provides a visual anchor for the .room. The collaborative design process with the homeowner yielded solutions that both blended into the existing decor and maximized utility, such as the picture rail continuing through the top shelf, the floor molding running alongside the drawers, and the period-appropriate brass grill to partially obscure the lower cabinet while still allowing for remote control signals for the audio & video equipment. 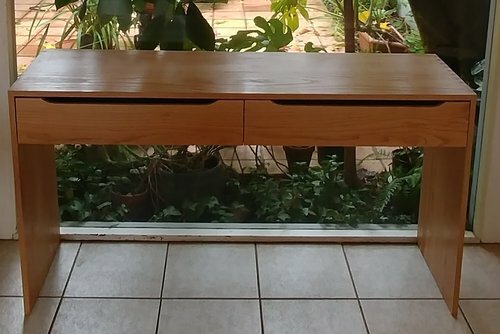 This stained oak bench blends into the existing decor and continues the lines and trim of the existing bench (i.e. : the turquoise cushioned area), creating practical storage and a perfect reading nook from which to look out over the Sausalito harbor. Walnut and birds eye maple veneered cabinet with solid maple matching grain drawer fronts, with angled drawers to fit and fully take advantage of the space afforded by the configuration of a recently-remodeled condominium. Read more about the project here. Inspired by a free-standing table with a few built-in shadow boxes, but no backlighting, I saw years ago at the New York International Gift Show, I built this piece for my loft out solid oak with a painted black finish that still allows the natural grain to emerge. In close up, the natural grain of the wood is more visible. Though the items are placed inside the box, many items work just as well on top of the glass. Dimensions are roughly 77" x 25" x 11", with eight 6" x 6" backlit shadowboxes. Combining a few pieces I had seen in fine furniture stores in the San Francisco Mission neighborhood, I came up with this design. Made of solid walnut, with two drawers and two cabinets - one of which holds wine (or martini) glasses, it artfully displays up to 16 bottles of wine, with the labels of the top eight visible through the glass panel on top. Dimensions of the main cabinet are 24" x 18" x 48", with an additional 6" of height from the legs. Highlighting the drawers (with soft close sliders) and cabinets. One of a pair of identical tables built using reclaimed client-provided oak boards from his legal office. Though I don't have the shop to build cabinets for full kitchen remodel, I certainly can whip up a cabinet or two on demand for a one-off need or to meet specialized requirements. This flush-mounted box-framed cabinet with a rail-and-stile door, mostly made of solid poplar, was installed on a remodel done by Mike Miranda (General Contractor) in Daly City, California. Pair of drawers designed to replace the missing drawers - with a unique flair - on an older cabinet with emotional significance for a client. 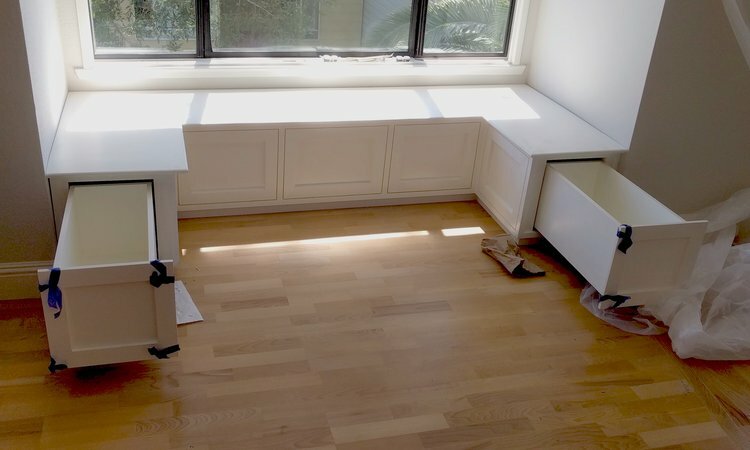 “Emergency” wood working project in Sausalito to complete the half-finished storage benches below the focal point bay-view windows of a beautiful home days before a housewarming, that had been left undone for several months by the prior contractor. The layout of the living room does not allow for a wall-mounted flat panel TV, so I built and installed this solid walnut mantle piece with a custom-sized motorized screen. I’ve built from detailed client designs as well as in a more collaborative process where the client has some rough ideas and is looking to me to flesh out the details. Especially where there’s a lot of design left in my hands, many of the projects benefit from a photo-realistic rendering to help visualize the piece prior to construction. Feel free to reach out on this process - its free if you purchase the piece, and available at a modest cost if you just want some help in exploring rough ideas. 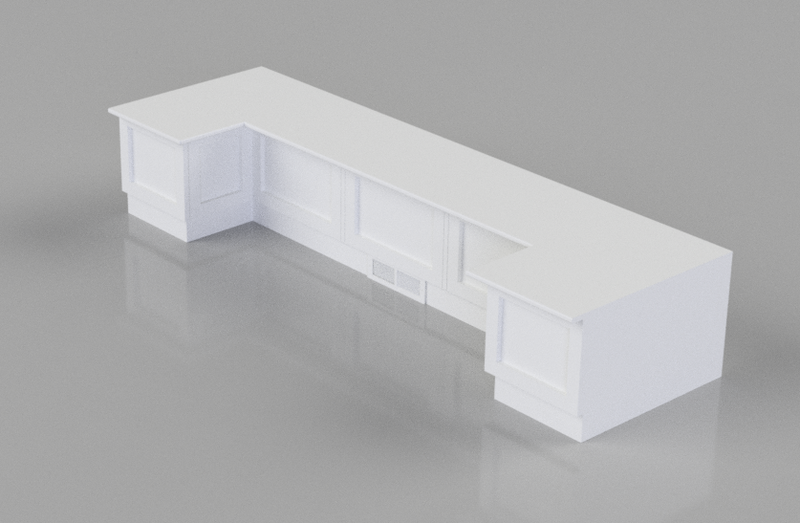 The client shared some rough ideas for a new home office, wanted to hide the computer while providing plenty of storage. Having just completed a remodel that left a trapezoidal space in their entryway, the client wanted a shelf / drawers, with a matching mirror frame. After exploring wood options together at MacBeath, they identified the combination of birdseye maple and walnut as the best match for their decor. This pair of diagrams shows the design evolution from first version to final version, highlighting the change of material from hardwood & veneer to paint grade; change in depth of the cabinets to allow for stereo equipment; addition of drawers at the bottom; and interaction of the arches and the shelves. This was one design option being explored for a remodel of a bathroom in San Francisco, featuring a double-wide concrete sink with open storage underneath. This image shows another advantage of these renderings. Beyond a beautiful photo-realistic picture, It also provides views from any angle, and - when we’re ready to get to that point - detailed dimensioned drawings and cutaway diagrams. This is a popular design I’ve built for one client (with built-in storage drawers), and explored with a few other clients. This novel coffee table leverages nearly one hundred antique brass PO boxes that the client had acquired, in a uniquely modern way.